Today got off to an auspicious start with not one, but two incidents worth remarking about as I cycled into work. The first heart stopping moment came when I was cycling through the back streets and a BMW swerved to a halt in front of me. Having skidded to a stop and wondering what he was playing at, the driver in question wound down his window and asked if I knew where the football ground was. Apart from having been guided far off route by his SatNav, I'm not sure of the etiquette for scaring a cyclist witless by nearly running them off the road because you're lost. Directions politely given, I went on my way only to encounter a crazy woman in a motorised wheel chair who tried to run me off the pavement as I walked my bike past a particularly busy bit of road. I'll admit to be momentarily confused when she started weaving her chair from side to side across the pavement as she approached, before the penny dropped and I realised that she was trying to force me to step off the pavement, into the road... In front of oncoming traffic. Ignoring the fact that I was on foot, pushing the bicycle, which made me a pedestrian and legitimate user of the footpath, what this lady was doing was dangerous in the extreme. If she had managed to force me into the road at that point, I'd not be sitting here typing this today. So a word of warning, watch out for excitable lost men in BMW's and crazy women riding motorised wheel chairs, they're the kind of danger the highway code doesn't tell you to look for. Back in the distinctly less stressful world of crafting, I've been continuing to play with Tunisian Crochet. 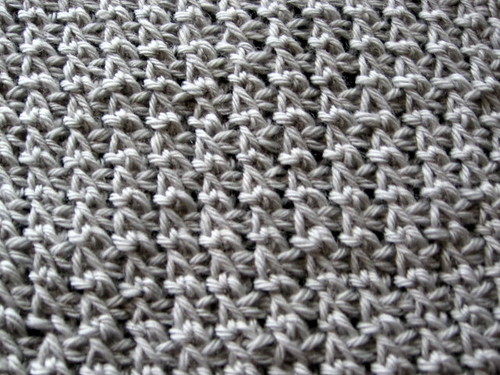 Next up for me is looking at crossed stitches and here we have a sample of Front Crossed Simple Stitch (FxTss). The idea here, as with crossed stitches in standard crochet, is to work the stitches in pairs, working the second stitch and then the first stitch, so they cross over. I've crocheted this swatch in a DK weight wool using a 6mm hook and since the foundation stitch is a Tss, I'm working the front loops throughout so there is a bad case of curl going on here. It's pretty though and the the resulting fabric is dense, with the stitches pulling in from the sides narrowing the swatch quite a bit compared with previous samples done on the same number of stitches. Extending a Tunisian foundation stitch means adding an extra chain once you've worked the stitch. i.e. you put your hook through which ever bit of the previous row you're picking up from, yarn over and pull through forming the standard foundation stitch... Then yarn over again and pull through a single loop, creating an extra chain and lengthening the foundation stitch you've just made. 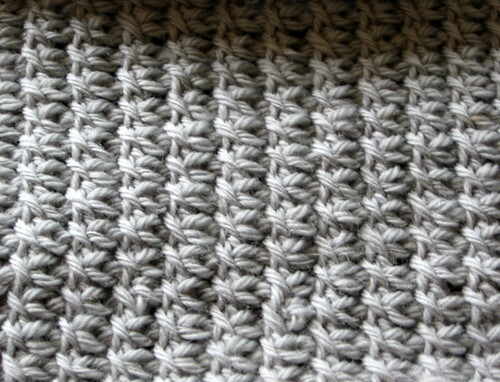 In this case, I've made a swatch of Extended Front Crossed Simple Stitch (ExFxTss). I've no idea if this is featured in the excellent Encyclopedia of Tunisian Crochet as I made it up on the spur of the moment, based on the previous swatch. Extending the crossed stitch gave the piece more drape, eliminated curl entirely and changed the pattern from little 'x's to inverted 'v's. Finally - it's been published by the Beeb, so that makes it official - knitting is good for you. Feh. I would have placed my bicycle right across the pavement, and stared her down. We've already had somebody injured by a mobility scooter maniac in Rugby - these old dears think they own the pavements! What scared me a few weeks ago, I followed a mobility scooter home from work on the A38 near me a manic dual carriageway average speed 60-70mph even at rush hour, another driver was that worried for scooters safety they followed them with hazard lights on until they reached a slip road travelling at 10mph, I put mine on too once we reached the slip road since I wanted off there and followed them on to a housing estate where driver went onto the pavement. Hmm crazy woman on scooter meets crazy woman on bike. Riples full of old dears on scooters, some on pavements, some on road, and a fair few who can't drive em for toffee.